TenguLife: The curious guide to Japan: The Essential Beginner's Guide to Japan - now in paperback! The Essential Beginner's Guide to Japan - now in paperback! More than twenty years in the writing but publishing into paperback was the hard part! 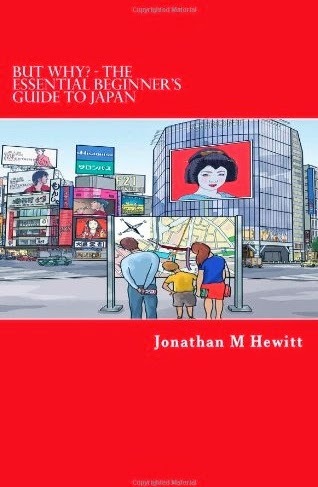 Now available on Amazon as well as The Beginner's Guide to Japan Book Store not to mention Kindle. Is Tokyo Japanese? How exactly do I use chopsticks? Being exactly wrong rather than inexactly right and why is English so difficult? These and hundreds of other questions are explained in an interesting and entertaining approach to life in Japan. "But Why? The Essential Beginner's Guide to Japan" is an invaluable companion for anyone on their journey through the Land of the Rising Sun whether directing a taxi, ordering pizza by telephone or trying to unravel the mysteries of reading and writing kanji. And exactly why are there people waving red batons at each and every construction site? With over twenty years experience on the ground in Tokyo, the I pass on the inevitable learning from having made nearly every mistake possible for a foreigner arriving for the first time. Japan is a wonderful country and “The Essential Beginner’s Guide to Japan” covers everything in daily life I wish I'd known on January 7, 1992.